Most kick scooter riders and potential kick scooter buyers are thousands of miles from being able to stroll into a certain New York City bike shop called NYCeWheels, but thanks to the Internet anyone is able to choose to buy the scooter that I have personally chosen as my current favorite scooter, the KickPed. I did not just stumble across it and decide to say it is the best. No, I have owned and ridden six different scooters in California, and before that, when I lived in England I had a few more. Each scooter had its good points and bad points and each was used hard and evaluated objectively in several riding situations. And for me, the KickPed is the best one of all. The scooter that I rode the most was a heavy, inefficient, steel child’s scooter that I bought new for $50 back in 1988. I lived at the time, a mile or so from Venice Beach, California, and would appear on the boardwalk daily, riding my little scooter, in an era where scooters were almost never seen. I was “Scooter Man”. Occasionally a child would happen by on a toy scooter, not that mine was not also a toy, and very rarely, the elusive dream machine known back then as a BMX scooter would make an appearance. But in general, it was all bikes and skates, besides me on my scooter. Although I should add that the future Patmont guys (manufacturers of today’s KickPed) were field-testing their prototype of the combustion engined Go-Ped in Venice that year, and getting hassled by the police even then. That $50 scooter wore out and the last pair of tires was kept in service with a can and a half of Fix-A-Flat. After donating the scooter, I was left with a hole in my life. I yearned to have another scooter. I flirted with bikes, got a bruised behind from the saddles, and even went through several models of stand-up electric scooters, which while fun, did not really fill the void left by my last human-powered scooter. We each have our preferred way to get around, but for me, the kick scooter, or leg scooter or push scooter is the vehicle that really gets me going. I love the simplicity and the efficiency, and I also, I have to admit, enjoy the attention. I will repeat at this point that my current scooter favorite is the KickPed, sold by NYCeWheels in New York, (or at their website, from anywhere). For me, the KickPed has all the right stuff. It is easy to ride, easy to push or kick, easy to carry and is the easiest scooter to fold and unfold. In recent years I have had a few remarkable human powered scooters, and I will comment on each here and explain why the KickPed is my current ride. The Sidewalker City was an amazing looking giant scooter, but it was inefficient. The footboard was too high, making it very tiring to ride, as the supporting leg had to basically do squats on every stroke. 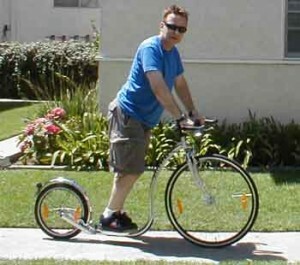 It was also pretty huge and was as cumbersome as a full size cruising bike when you wanted to park it or transport it. At 26 pounds, it was a little on the heavy side, and in 2003 it cost $299. It was a good argument for the inefficiency of scooters, but it did cause a stir and attracted many curious onlookers. Clearly the KickPed is faster, lighter, easier to carry and less expensive than the Sidewalker. The KickBike Millennium Racer was a scooter of the sort that is raced by European athletes. Scooters have always been more popular in countries such as The Neteherlands and the Czech Republic. They call them Footbikes, and there is a FootBike brand, but mine was a KickBike. With its large front wheel from a racing bike and its 100 pound tire pressure, the KickBike would fly at terrifying speed over bumps and cracks, stopping at nothing except the steepest of hills. On a downhill it would speed along like Lance Armstrong, passing teams of cyclists, and I would see the road beneath me as death in waiting. Luckily I never once wiped out on that KickBike. Despite it being fairly easy to remove the front wheel and toss it in the car, the KickBike was a never a vehicle that you could hop off, fold, and carry, so it never had the full convenience that is a major advantage of a scooter. It weighed under 20 pounds and in 2003 it cost $299 plus shipping. The KickPed is easier to carry, more convenient, and less expensive than a KickBike. 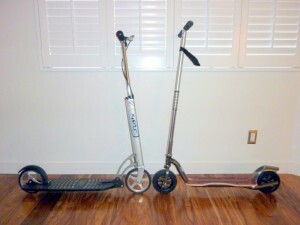 The Xootr Mg is one of the more popular versions of the Xootr scooter range of foldable kick scooters. Sometime around 2005 I had just written a magazine review of the KickBike on the-vu.com, and a man who’s name I unfortunately cannot remember asked me if we could meet and ride each other’s scooters. He showed up in a van containing folding bicycles, two Xootrs and if I remember rightly, a Know-Ped with a shaved deck. Or perhaps it was a Xootr Cruise with a shaved deck, but whichever it was, he was onto something, as a shaved deck is one of the star features of today’s KickPed. Anyway, we rode together up to the top of Beverlywood and back, a steep climb up and free ride back down, about three miles, with he on my KickBike and myself on his Xootr MG. The next day I found myself ordering a Xootr MG. When the surface is smooth and dry, the Xootr is hands down the best scooter you can get. The deck is low, the rolling resistance is minimal. and it is simply the most efficient scooter, and is also reasonably easy to fold, unfold and carry around. If all surfaces were always smooth and dry, there would be no beating the Xootr. But, not all roads are smooth are they? That is why I think the KickPed is the better scooter in the real world. Compared to the KickPed, the Xootr MG was very noisy, very bumpy, harder to fold and unfold, prone to sudden grinding stops on uneven pavement, and it skidded unnervingly on damp or wet pavement. 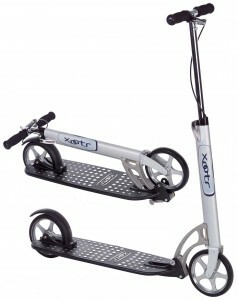 But there is no denying that any Xootr is a great scooter. The NYCeWheels store in New York has a custom version of the Xootr MG called a CityKicker. Other Xootrs include the Venus and Roma models which have a narrow deck for improved scooting efficiency. The KickPed is much safer, much quieter, much more comfortable, and yet still almost as fast as a Xootr, actually faster on the uneven sidewalks around this neighborhood, which often require a dismount and walk if you are on a Xootr. It is no secret that my current favorite scooter, the KickPed, is adapted, very cleverly, from an existing product, the Know-Ped. Despite the KickPed being arguably better in a few ways, an original Know-Ped push scooter is still a nice scooter. I had a blue one for a while, but I lost it in a burglary in 2003, before I really had a chance to put many miles on it. I do remember that I wished the bars were an inch higher, and that the kick stroke was a bit too far out to the side to be completely efficient, but it was a nice smooth ride on an over-engineered platform that was originally designed for a combustion engine driven scooter. The improvements that NYCeWheels brought to the Know-Ped when they designed the KickPed are all very effective. 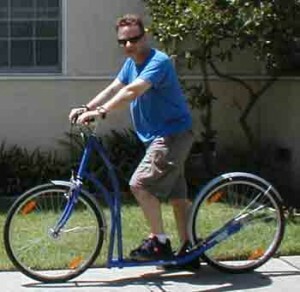 Especially the version with the taller handlebars when the rider is taller than five feet ten inches. As long as these KickPeds are available there is a good reason to consider one over the older Know-Ped for your next scooter. I realize that not everyone has the patience to buy and sell their way through five or six scooters just to find out which is the best choice for them, but if you take my suggested direction, you’ll be very happy with a KickPed, or the original Know-Ped, and slightly less so with any other choice. PreviousPrevious post: Why choose a kick scooter? I am interested in Sidewalker Scooter. I would greatly appreciate receiving information, brochures and price lists you may have to learn more about Sidewalker Scooter. I am planning for a long distance travel on Sidewalker Scooter and will be interest in purchasing two similar Sidewalkers. Also let me know if you are able to ship it to Christchurch, New Zealand. This is just a magazine. We don’t sell scooters here. You should use a search engine to try to locate a vendor. Has anyone tried a seated scooter? I have a Voyager seated scooter, big mistake, it’s like scooting a sack of spuds, surely the supporting leg is used in the propelling even with a knee scooter, but how’s it work on a seat? Scooting while seated is extremely inefficient. This device is intended as a mobility aid to enable those with leg injuries to slowly move around while seated on a saddle. It is not so much a vehicle for recreational transportation. It is more of an alternative to a walking frame. Thanks for the review, I have a KickPed and I love it. They shipped it to me in Switzerland. I ride it down a big bumpy hill to get to the train – it looks so tough, it turns heads. I am 6’5 and 100kg+ and the KickPed is totally up to the challenge ! !